I saw my eye doctor back in October, two weeks before BlizzCon. There was a slight change in my prescription which would necessitate new glasses. I really like Coastal.com so called them to see about glasses. It was determined that I probably wouldn't get new glasses before leaving for California and I really didn't want them to come while I was gone, even though Pam was picking up the mail. I would order new glasses when I came back. In hindsight (isn't that generally the truth), I should have ordered glasses and had them waiting for me because I got busy and then I had other expenses and it was the receipt of my tax refund which spurred me to finally buy that new pair with the new prescription. It was time. Here is the old pair. In this light, the frames look black, but they were a dark navy blue. I liked them the first 6 months after getting them, but, since December, I had a problem with them sliding down my nose, even if I didn't bend over. 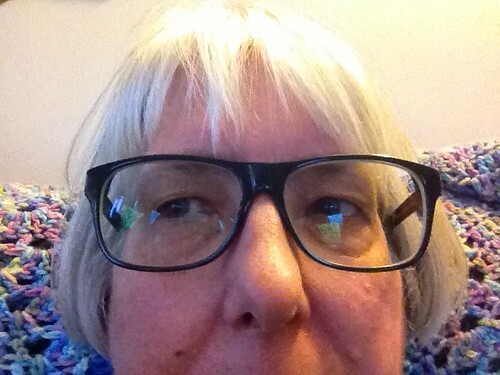 I probably wouldn't have considered new glasses even with a tax refund if they hadn't been problematic. There's nothing you can do with plastic frames, about nose slide. They are formulated for a specific measurement. With this problem in mind, I searched the Coastal site and found these. I've gone back to a wire frame. The gal who helped me at Coastal said there is much more room to adjust the fit with wire frames than with plastic. I can adjust the nose pads and bend the glasses slightly to fit an odd size. I went with a more pronounced blue and it's sparkly! I like the bigger lens size. Coastal was having a 50% off sale on lenses when I ordered. That's where eyeglass manufacturers get you. 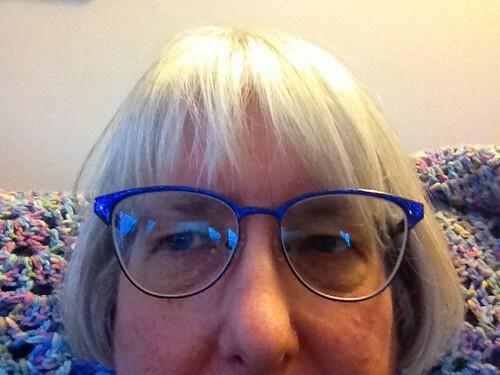 A $29 frame is nothing if you have to put no-line bifocals in them. There's been a bit of an adjustment. I still take them off when I read or when I do cross-stitch. Sometimes, things are blurry in the distance, if I look through the bottom of the lens and not the top. It's about unlearning habits because the glasses I had were out of focus for me. I expect this is what my life is going to be like going forward. There may, or may not, be an incremental shift in my sight and I'll need to get glasses roughly every year or 18 months. Dr. Park was very happy with my eyes, saying there is no sign of any RA complications affecting my sight. Any incremental shifts are simply age-related. Ah yes, age. I've been on this earth for a few years. Some day, when I'm bored, I should try to figure out how many pair of glasses I've had since I got them in 7th grade.